Having grown up and served during the cold war prior to the present unpleasantness, artifacts of that era hold something of a fascination to me. 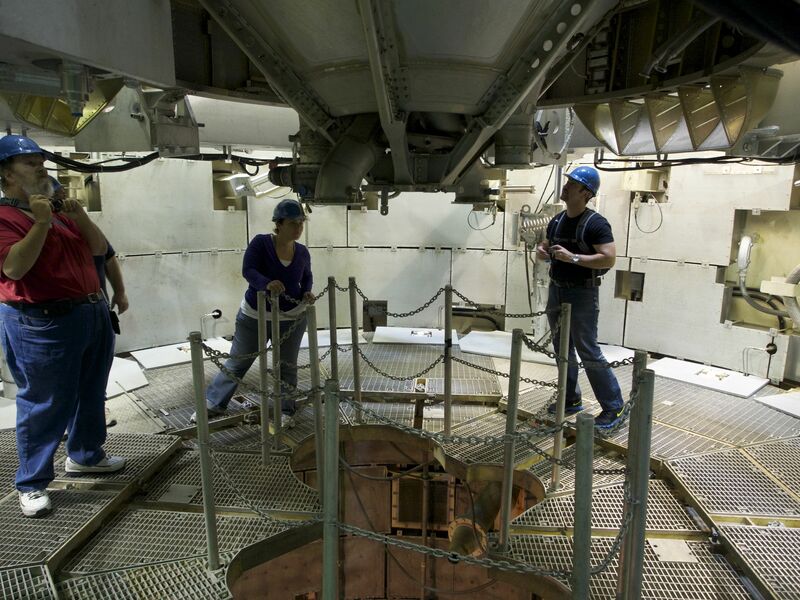 Since Her Accuracy also seems to have quite the interest as well, over the years we’ve managed several trips, some of which (like the Trinity test site) are not particularly easy to get to. One of the common frustrations I have is that very few places let you inside an exhibit – I’d love to explore a B-36, for example, but the places that have one restored to near operational status are understandably hesitant to let the unwashed masses rummage through their irreplaceable exhibits. 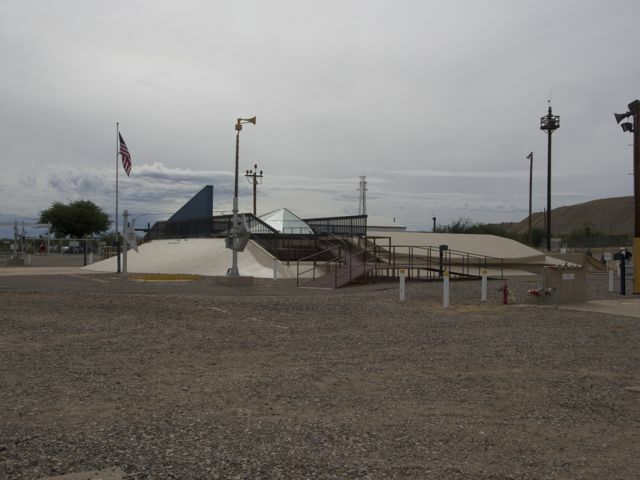 This weekend we visited the Titan Missile Museum just south of Tucson which is the exception to that rule. 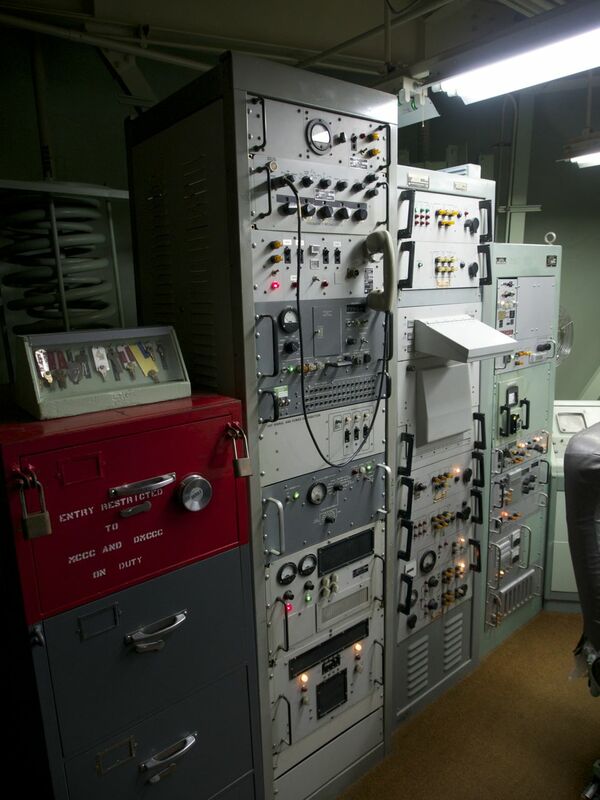 Complex 571-7 in Green Valley, Arizona was operational from 1963 till the Titan II was decommissioned in 1987. One of 54 site around Tuscon, Little Rock and Wichita, someone had the amazing foresight so suggest saving a silo complex for posterity. Bless them, whoever they are! We took the “Top to Bottom” tour with museum historian Chuck Penson as our guide. 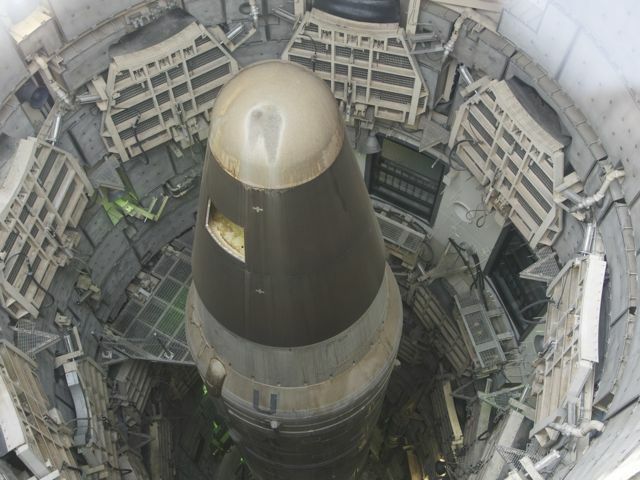 Since missile sites aren’t generally designed for easy access there’s a release to sign, a safety briefing, and encouragement not to exceed ones comfort zone. Since there are ladders and reasonably tight areas to get through this isn’t a formality. 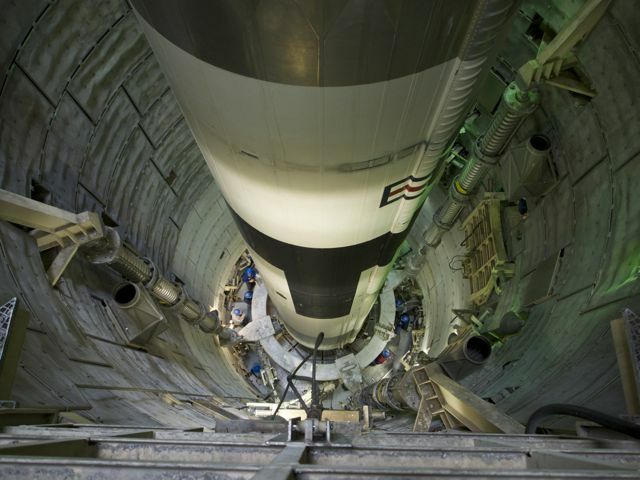 Following a brief movie on the Titan II we head for the entry area where we descend the stairs to the blast lock. These are the concrete and steel doors that separate the hardened area of the complex from the outside world. Like the standard tour we start in the Launch Control Center where the equipment and procedures are described, including a demonstration of of the launch sequence. The first time through the control center it seemed like there was a lot there to watch, but on the Top to Bottom tour we spent more time discussing the layout, and having the time (and the smaller group) to get a closer look at everything it becomes apparent that there was a logical division of the systems. 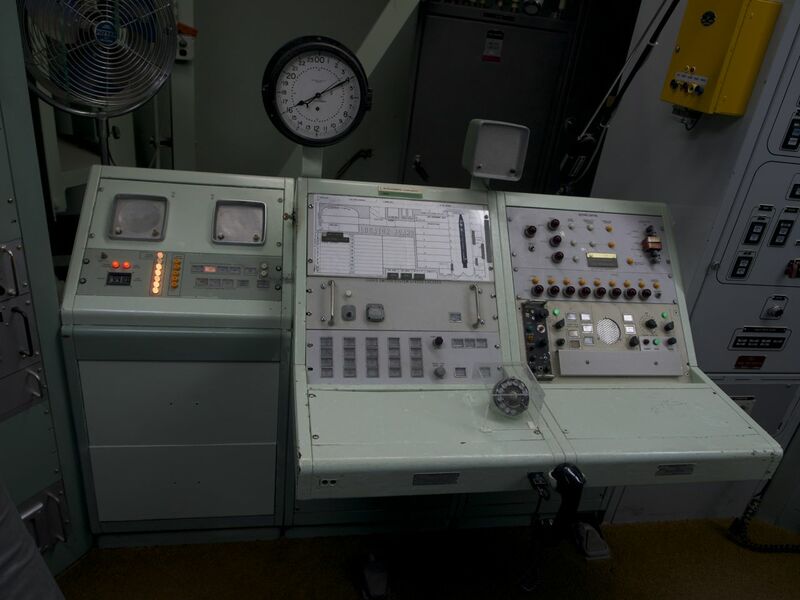 The racks behind Chuck in the video are (left to right) the site power distribution panel, the missile systems fault locator, the control monitor group which sequences everything properly for launch, the control power panel, and the missile guidance-alignment checkout group, also known as targeting. 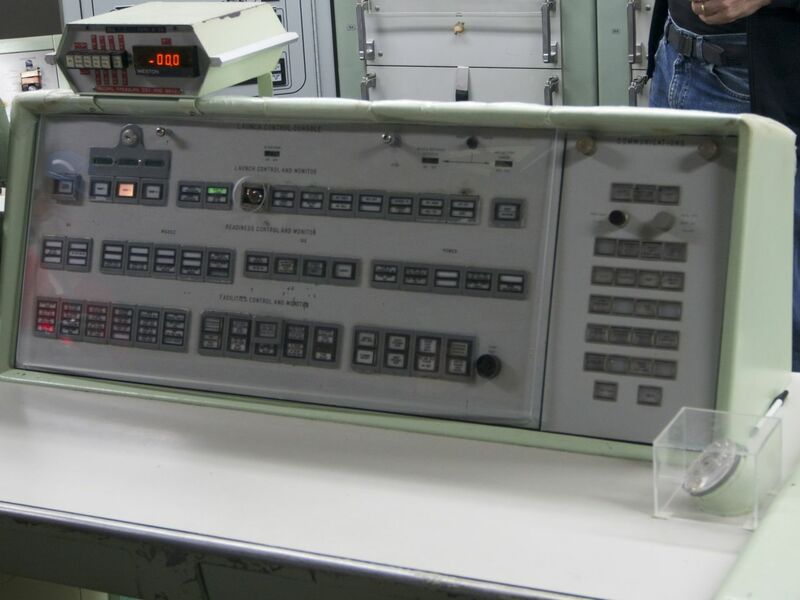 The Launch Control Complex Facilities Console is primarily the missile and silo control panel. The plexiglass panel on the one pictured above is a museum addition to protect the panel since every tour gets to launch a missile. The Alternate Launch Officers Console is primarily a communications console, which explains why it is frequently covered in photographs taken in active Titan sites. The second key required for launch is visible in the photo above in the side of the console just below the clock. The two keys are far enough apart to prevent one person from activating both keys at the same time. UHF, HF and LF communications racks. 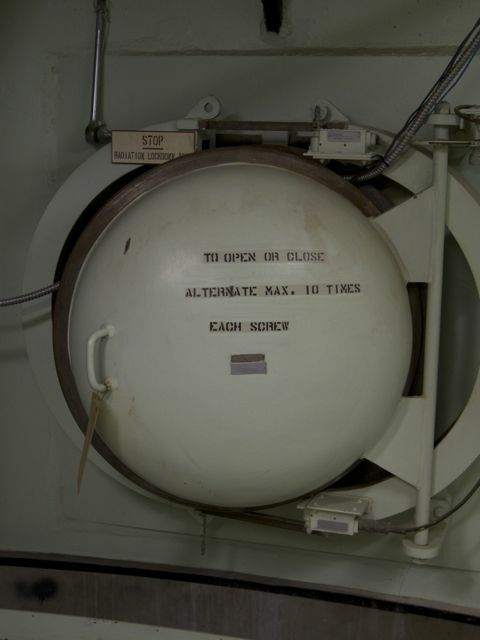 Behind the ALOC is the safe that would contain the launch codes. Note the two locks – each officer on duty would have the key to one of them. The next set of racks have the high frequency and UHF transmitters and receivers and the low frequency receiver. Level 2 of the LCC. The launch control center is not very large, but since the normal alert staff would consist of only two launch officers and two enlisted technicians it’s not claustrophobic. We were given a copy of the Air Force complex familiarization handout given to launch crews that listed everything to be checked out during an alert shift and it’s clear that missile crews did not spend all their time staring at the panels. Our tour lasted over 5 hours to to access all the levels. 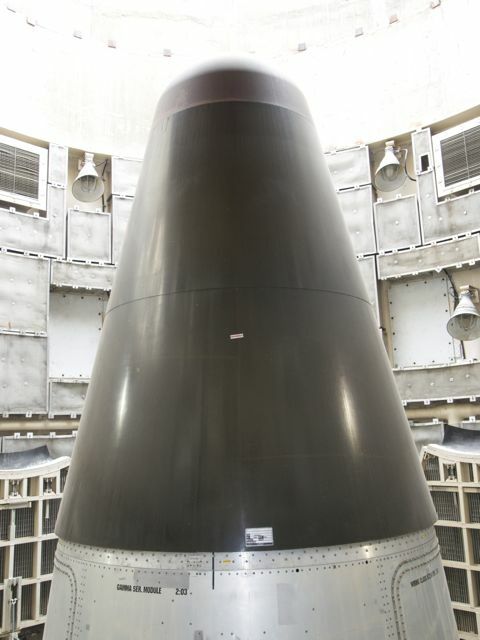 Even given the familiarity with the systems a missile crew would have, I could see it easily taking two hours just doing the physical inspections, and I’m sure there were regular test and maintenance activities to perform as well. The upper level of the control center is the living area where the break room with the stove and refrigerator are as well as the sleeping area. The lower level has the ventilation and radio antenna controls. 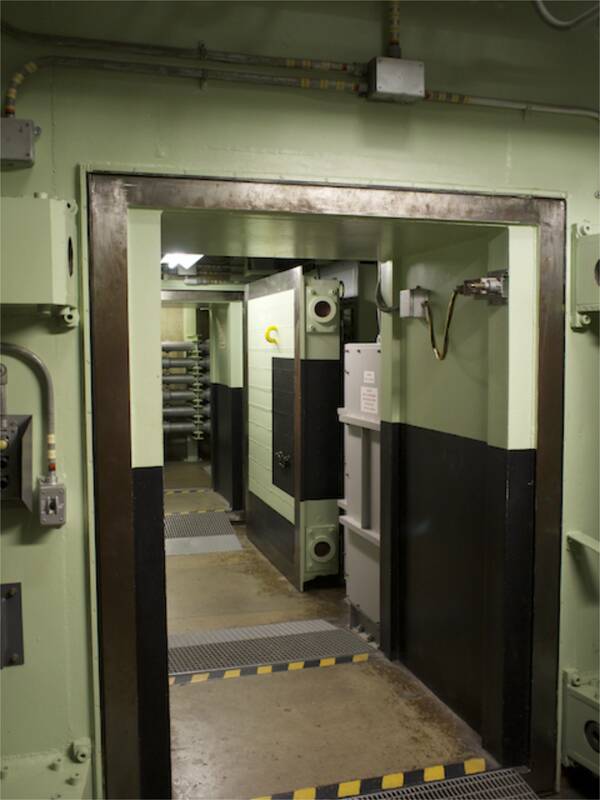 Also in level 3 is the hatch to the ventilation duct that served as the alternate escape from the control center. The normal entrance was not expected to survive a near miss. Given the remote location of these sites, leaving the area would be problematic after a nuclear exchange in any case. Once through touring the control center a short walk through the cable way leads to the silo. 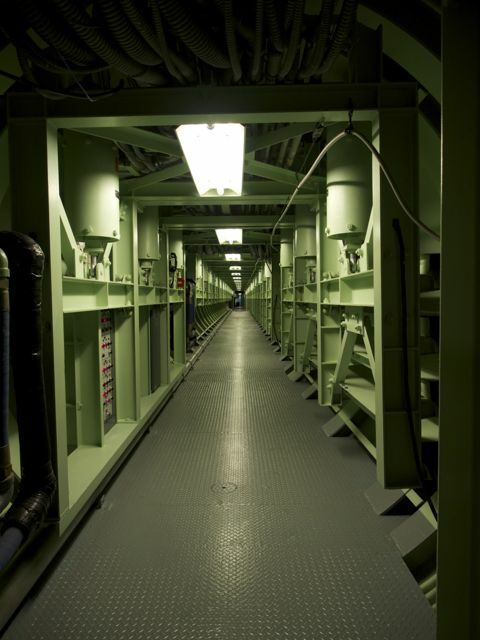 Consisting of an inner launch duct where the missile sits and an external duct surrounding it with the support equipment, the cable way enters on level 2 of the silo. 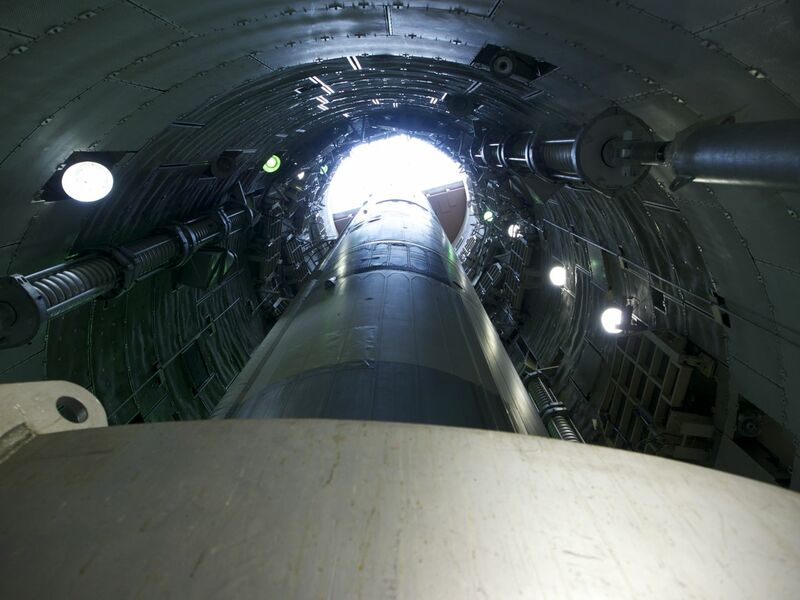 The museum had two windows cut into the launch duct through which the missile can be observed. Since we were on the top to bottom tour we encountered our first ladder at this point, up to the hydraulic and engine compartments that drove the 700-750 ton silo door. This door is now permanently blocked in the half open position. Moving down through the silo we next went to level 3 where after taking the hard hats off we could lean out into the launch duct through one of the access doors. If you look closely you can see another group on level 7. That ring around the missile at the bottom is the thrust mount. It’s suspended by those large springs you see on the side of the launch duct. The missile sits on the thrust mount secured by 4 explosive bolts. 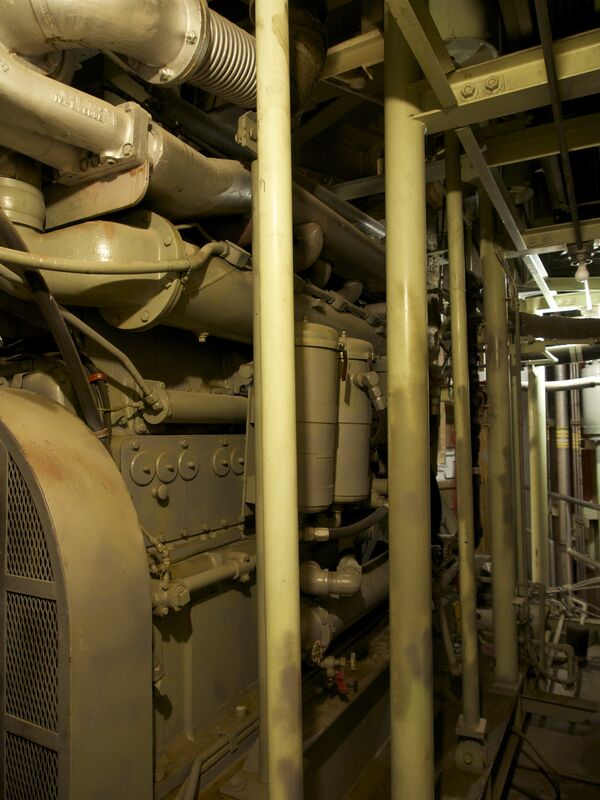 Level 3 is also where the diesel generator skid that provides emergency power is located. While there isn’t a whole lot of extra room, there is plenty of access to all the equipment. The photographs make it look more crowded than it is. 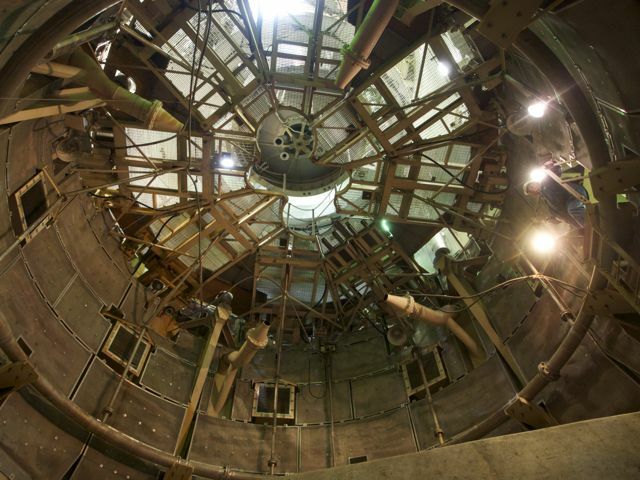 At level 7 we enter the launch duct just below the thrust mount where the engine would be. 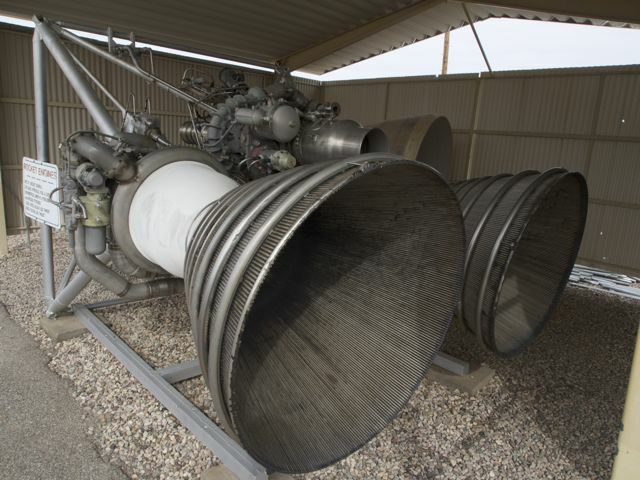 When asked why the engine was removed Chuck had an excellent answer – “We didn’t expect to be taking anyone down here.” The good news is that they’ve acquired enough parts to assemble another engine to mount, although it will have to be brought down in pieces – the elevator isn’t very big. Then down to the blast deflector. Those big water pipe looking things sticking out of the wall are indeed big water pipes. Just prior to launch water from the 100,000 gallon hard water tank are dumped through here to be turned into steam. 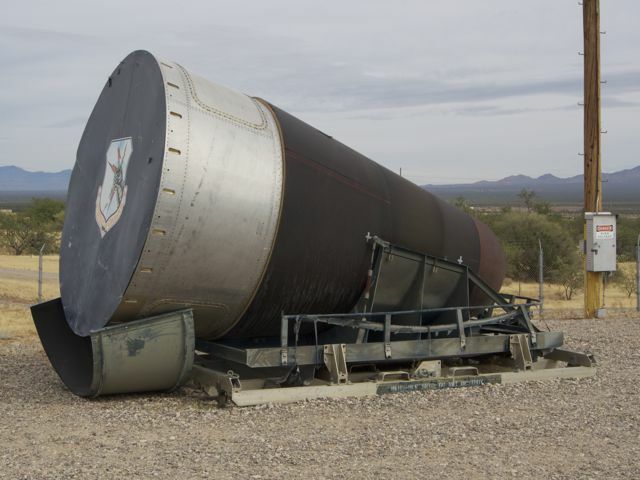 This steam along with sound insulation throughout the launch duct are necessary to prevent the noise of launch from destroying the missile before it can clear the silo. …As is another Reentry Vehicle. Finally there’s the obligatory photo through the glass weather cover that has been built over the open portion of the silo. Looking into the silo from the surface. The hole in the RV is to prove to foreign spies that there really isn’t a physics package installed. Thanks again to Chuck Penson for a great tour. It’s timely that you share this visit, as I drove by the Titan #10 site yesterday with another fellow. On the way home we discussed the ring of active Titan II sites that once existed around Tucson, but are now abandoned or destroyed. I also had the privilege of meeting a retired LTGEN some months ago who, during the 60’s, was an Intelligence Officer serving with the Missile Wing at DM, and who remembers quite a lot about those days; fascinating fellow. Thanks for sharing this, Pogue. A friend of mine in my car club was an Air Force Captain assigned to one of these in North Dakota. To see a picture of him then – looked like a kid with captain’s bars. Thanks for posting this! I’ll have to really go through it when i am off work. But I thought I read somewhere someone was converting one to a home? Go to silohome.com and you won’t believe it. For sale, even. In the middle of a New York state park. Durn you, BusBob. Now I’m down a rabbit hole at that site and another, Missile Bases.com. Methinks the Denver site, with all that spare dirt, would be precious indeed. I’d have my own Stargate Command in no time, if’n I could scrounge up $2.8M to start and prolly another $1M to refurb the joint. Grow crops, raise livestock, and host all manner of wargamers on private training ground. What’s not to like? Naturally, you’d all be invited to the house silo warming. I might even let you sit at the console and pretend you’re dialing up the Stargate! Lots of history there-I was there in the late 90’s.. 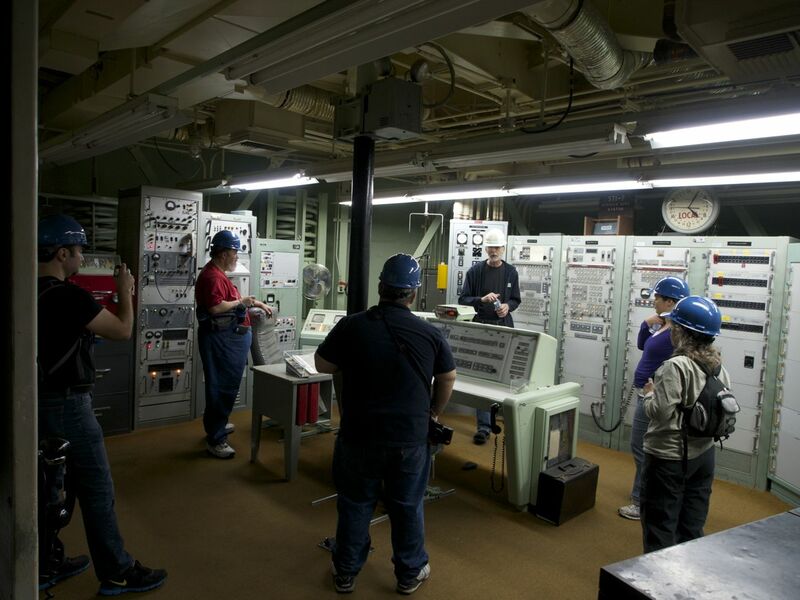 The guy who gave a tour was a Manhattan Project Engineer.. Her Accuracy and I visited it in the late ’90’s. Amazing! We saw stuff I’ve never seen without a Marine guard before. After 9/11 they moved the museum off of Kirkland AFB, and I think a lot of the really neat weapons stuff is no longer on display. Sounds like an interesting tour. I was at a restored MInuteman site while out west a few years ago, but the tour was already fully booked up. We had an ex-missile guy as a Sr O-3 NAv F-4 back-seater in our Squadron in the UK in 70s–went the Nav route to get out of the hole, as a result HE was happier than a pig in you-know-what (“The view is so much better up here” lol) compared to other Navs–let alone HIGHLY discontented young rated pilot back-seater 2nd/1st Lts that were the norm when I first checked out in the F-4.in ’67. I called my friend I mentioned about here earlier and he said a few things I thought you all would find of interest. 1. They had some Russian visitors and the Russians told them (out of professional admiration) that they couldn’t believe how young the crew was, how systematic -, neat and orderly the site was. (makes you wonder what was aimed at us). I’m thinking some old solder loaded with vodka? 3. Their motto was “ If there is a problem anywhere in the world, we can be there in 30 minutes …or less! He was talking about the psychological stability you had to have – being in a dark hole – and they had a system for dealing with – crew who “got twitchy” as he put it. There was one during his time who did go twitchy. We both admired those who serve – for months underwater – in a submarine. Some if my friends have been diving in a flooded Titan silo in Eastern Washington near Royal City. DCS Films has a good page to look at too. http://www.dcsfilms.com/Site_4/Diving_Missile_silo.html or you can look at their documentary at http://vimeo.com/19172657. Fascinating stuff. You most def wouldn’t want anyone to go `troppo` around the go button of one of those – “sorry”, just wouldn’t cover it. Fascinating, and thanks for this, Pogue. I was fortunate to watch and/or hear/feel (heh) a number of Titans lift off from Vandenberg while I was stationed there from ’64 – ’67. A Titan launch is literally an earth-shaking experience. My buddy and I discussed the what-if on the way home Sunday, especially since back in the day, one he knew quite well, being in his 70’s. I could see his point. Thank God cooler heads prevailed in those days. I have no such illusion about national leadership today, either here or elsewhere. I hear ya about “cooler heads,” Mongo, both today and yesterday. It’s those fanatics in Tehran that scare the krep outta ME. Little Gallows humor here; The two best cartoons I’ve ever seen on the subj were years apart. The first, in the early/mid 50s at height of the Cold War when Sports Illustrated had sports cartoons in its early years, showed a foursome on the putting green starring at a mushroom cloud in the distance with one saying: “Don’t worry, we’ve got time to put out before the shock wave hits.” The second, I saw on a postcard w. a Greg Larson cartoon in 1995 showing two guys fishing in a mountain lake in a canoe looking at a nuke blast lighting up the sky on the other side of the mountain with the guy in the back saying with a crazed look on his face: “You know what this means, Fred? No size limitations and screw the limit!” LOL. Castle Air Museum in Atwater, California, has an open cockpit day a couple times a year. I have been in the cockpit of their RB-36H. 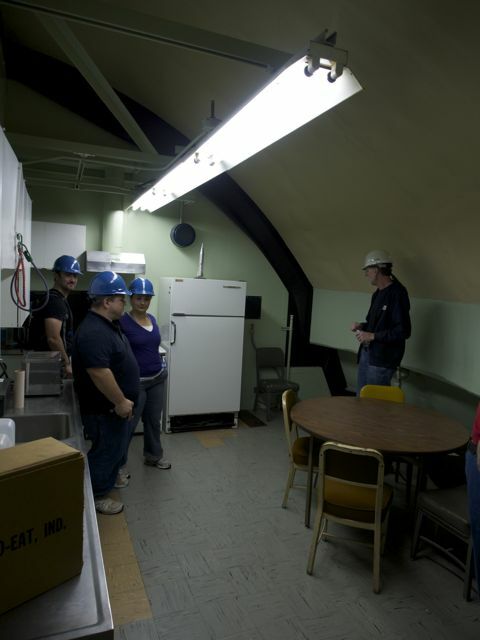 Also, if you get with one of the volunteers, you may be able to drum up a behind the scenes tour. It takes some talking and good luck, but it is not impossible to go where you want to go. These people are proud of their aircraft and any interest by the public seems well received!